Each year, Paris digs up about 10,000 tons of old cobblestones as it rebuilds or repaves its streets. Used cobblestones are now being offered for sale online. The cobblestones of Paris have seen some things. Jaunty French soldiers marched over them in 1914, as did jubilant Free French liberators in 1944, and they were rolled over by the tumbrels of 1793 and the panzers of 1940. They were hurled at the police and piled in barricades in 1848 and 1968. They’ve been shown rain-slicked in countless paintings and photographs. Now you can own one. Used Paris cobblestones are being offered for sale online at Mon Pavé Parisien — monpaveparisien.fr — spruced up and suitable for showcasing on a mantel or étagère anywhere in the world. Each year, the city digs up about 10,000 tons of old cobblestones as it rebuilds or repaves its streets. It used to discard them along with other rubble. But officials recently hit on the idea of salvaging the stones and selling them, to spare the city the trouble and expense of hauling them to the dump. “Rather than have cobblestones thrown away, we collect them, we clean them and give them a second life,” said Patrick Marchetti, head of the city maintenance yard where the stones are stored. The intended buyers were contractors and others who wanted to build with them. But an entrepreneur named Margaux Sainte-Lagüe saw an opportunity. Last September she bought 5 tons of the cobblestones for about $215 and set about turning them into keepsakes for local and foreign buyers eager for a bit of Paris laden with memories. Sainte-Lagüe polishes the stones, which weigh from 2 ½ to 6 pounds, and hand-paints them in various designs, from the simple tricolor of the French flag to an eye-catching gold-plated version. She’ll personalize them on request. In true collectible fashion, she gives each stone a number and a “Made in Paris” certificate. All that transforms an 8-cent paver into a souvenir priced at $64 to $160. She’s sold more than 100, and shipped them to buyers as far away as Oklahoma and China. The streets of Paris were first paved with stones in the 12th century under King Philip II, and the practice continued well into the 20th century. 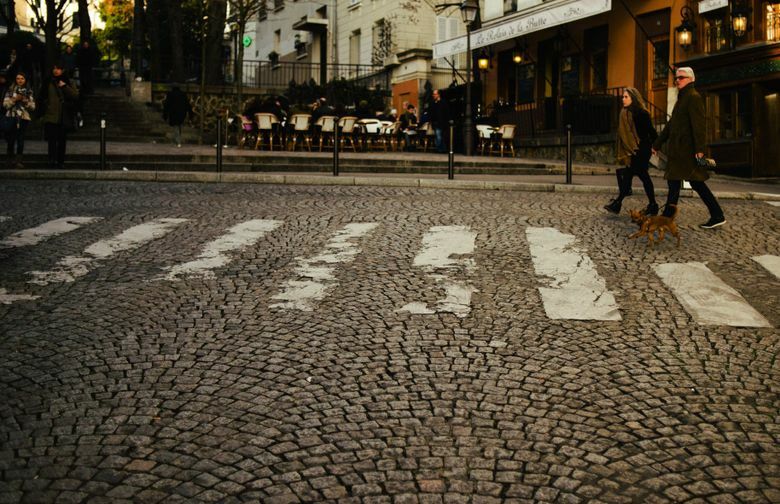 These days, cobblestones are buried under the asphalt on about one-third of the city’s streets, but they endure as the surface pavement on a few iconic boulevards and squares, such as the Champs-Élysées and the Place de la Bastille, and in the narrow alleys of historic neighborhoods like Montmartre. As souvenirs go, Sainte-Lagüe said in an interview, a cobblestone has one clear advantage over the miniature Eiffel Towers and Joconde-emblazoned T-shirts that tourists snap up by the hundreds of thousands every year: It is sure to last. “It’s a piece of history,” she said.